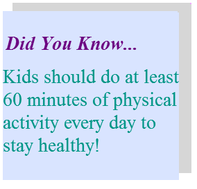 This website has suggestions for kids and parents on how to stay active and eat healthy with friends and as a family. ​This kid friendly website offers recipes, activities, and videos to promote healthy living for families. 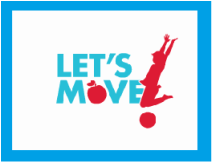 An event that encourages kids, parents, and educators to walk or bike to school to promote healthy habits, safety, and helping the environment. Here you will find ideas on how families can incorporate more physical activities into their daily lives. An activity guide that kids can use to stay active while watching TV to promote a healthy lifestyle and less time sitting. How many minutes a day do you engage in physical activity?